Apple Watch is still a few weeks away and in the meantime, we’re learning more and more about Apple’s first-ever wearable. As the week comes to an end, multiple publications are reporting that AppleCare+ pricing has been revealed to them by sources familiar with the matter. Starting with the entry-level Apple Watch Sport, users can expect to pay $59 for an extra year of technical support for a total of two years as well as two incidents of accidental hardware damage. The mid-range, stainless steel Apple Watch will command $79 for the same extended support and accidental damage coverage. 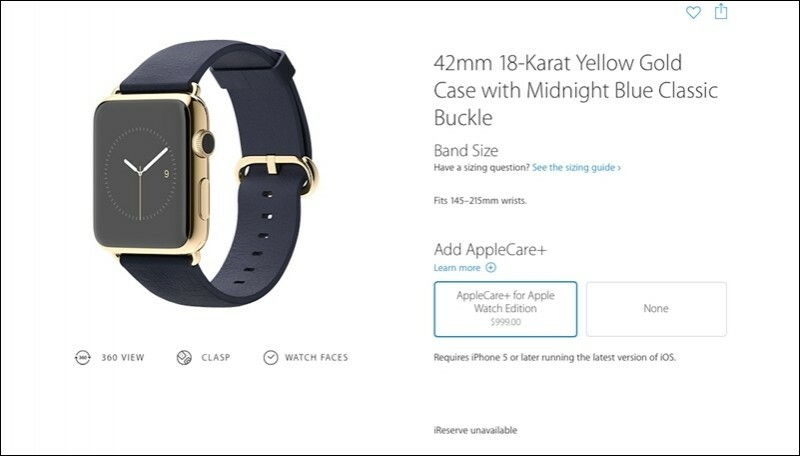 AppleCare+ protection for the premium Apple Watch Edition will reportedly set buyers back $999. This high-end 18-karat gold variety (which starts at $10,000) already includes two years of technical support upon purchase. AppleCare+ adds a third year of technical support and accidental damage coverage for up to two incidents. It’s unclear at this hour how much Apple plans to charge for repairs under AppleCare+. With the iPhone, accidental damage claims are settled with a $79 service fee. Speculating a bit here, I suspect repair fees will scale depending on the model and could be quite expensive for Apple Watch Edition owners. AppleCare+ for the iPhone can be added during purchase both online and in-store. What’s more, the protection can be added anytime within 60 days of the initial purchase. While unconfirmed, it’s likely that Apple will adopt a similar policy with Apple Watch.